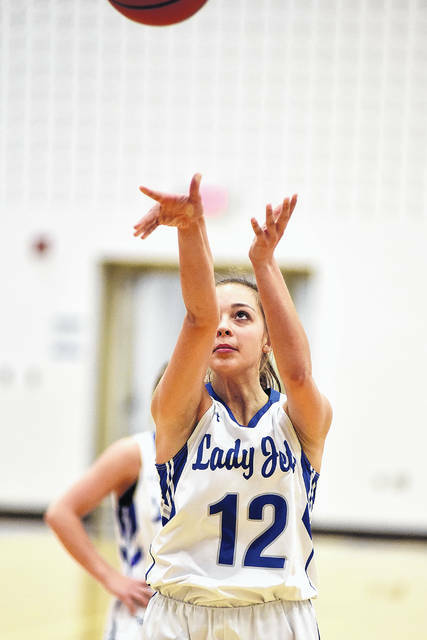 Belle Cable shoots a 3-pointer from the corner in a Cross County Conference rivalry game against Arcanum on Thursday. Cable finished with a game-high 21 points in leading the Jets to a 55-26 win over the Trojans. Arcanum’s Camille Pohl tries to shoot with Franklin-Monroe’s Corina Conley guarding her in a Cross County Conference rivalry game on Thursday. The Jets defeated the Trojans, 55-26. Franklin-Monroe’s Chloe Peters goes in for a layup in a Cross County Conference rivalry game against Arcanum on Thursday. The Jets defeated the Trojans, 55-26. 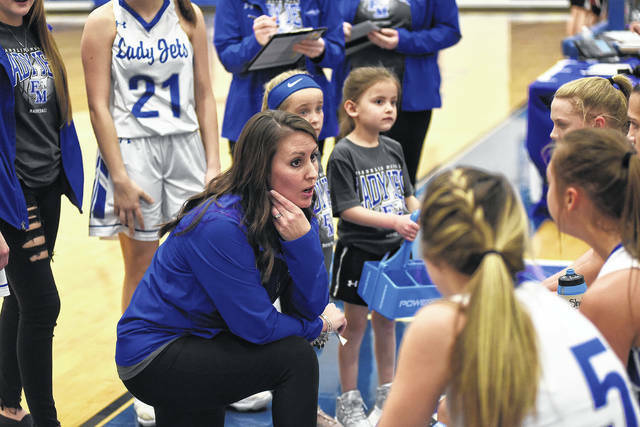 Franklin-Monroe coach Abbey Moore talks to her players during a break in the action of a Cross County Conference rivalry game against Arcanum on Thursday. The Jets defeated the Trojans, 55-26. Franklin-Monroe’s Corina Conley goes in for a shot against Arcanum freshman Taylor Gray in a Cross County Conference rivalry game on Thursday. The Jets defeated the Trojans, 55-26. 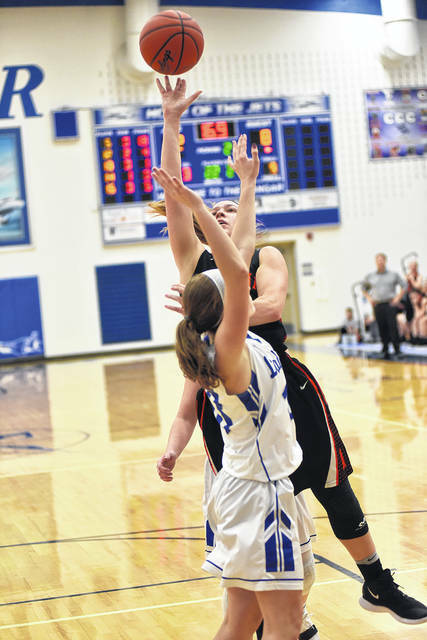 Arcanum’s Elliana Sloan puts up a shot during a Cross County Conference rivalry game at Franklin-Monroe on Thursday. The Jets defeated the Trojans, 55-26. Arcanum freshman Hailey Unger goes in for a layup in a Cross County Conference rivalry game at Franklin-Monroe on Thursday. The Jets defeated the Trojans, 55-26. Arcanum’s Kayla O’Daniel tries to shoot over a Franklin-Monroe defender during their Cross County Conference rivalry matchup on Thursday. The Jets defeated the Trojans, 55-26. 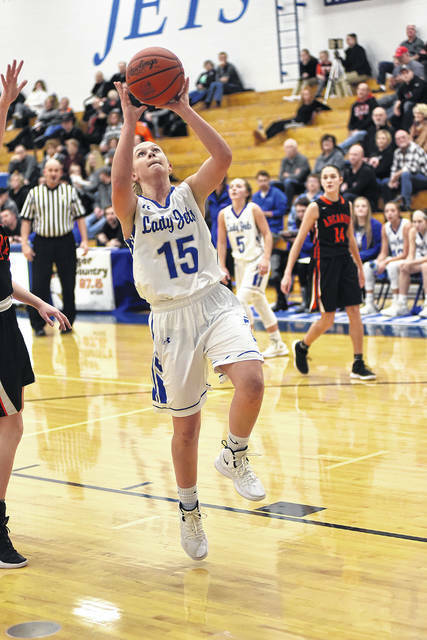 Franklin-Monroe’s Kennedy Morris shoots a free throw in a Cross County Conference rivalry game against Arcanum on Thursday. The Jets defeated the Trojans, 55-26. 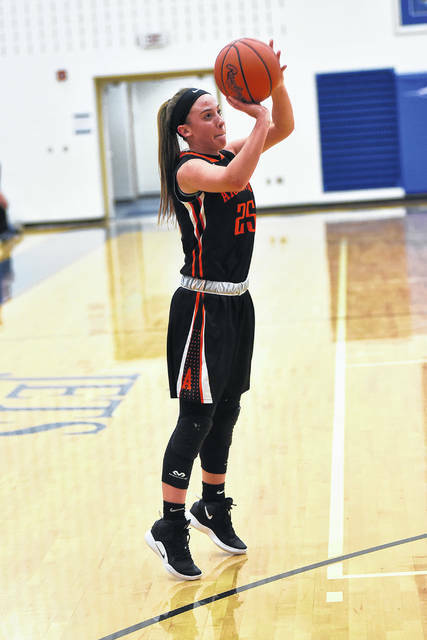 Arcanum freshman Madelyn Fearon shoots from 3-point range in a Cross County Conference rivalry game at Franklin-Monroe on Thursday. The Jets defeated the Trojans, 55-26. 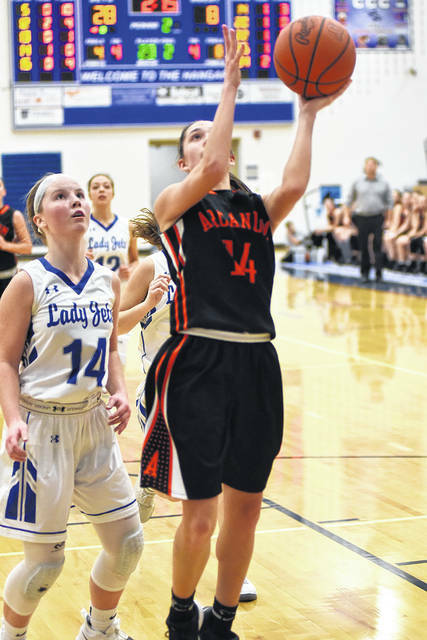 Arcanum freshman Taylor Gray has the inside advantage on a Franklin-Monroe player in a Cross County Conference rivalry game on Thursday. The Jets defeated the Trojans, 55-26. 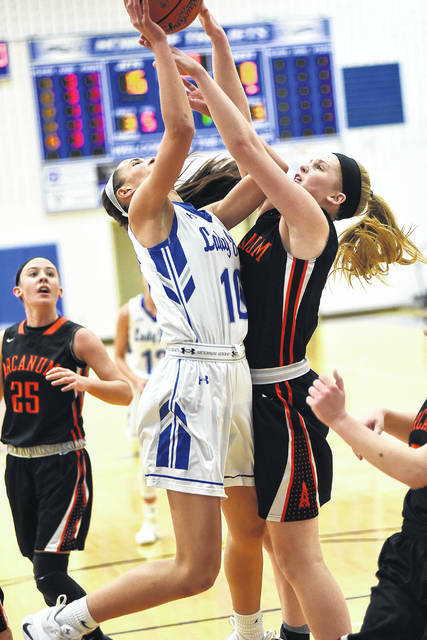 Franklin-Monroe’s Skylar Bauman puts up a shot with Arcanum’s Gracie Garno trying to deflect the shot in a Cross County Conference rivalry game on Thursday. The Jets defeated the Trojans, 55-26. 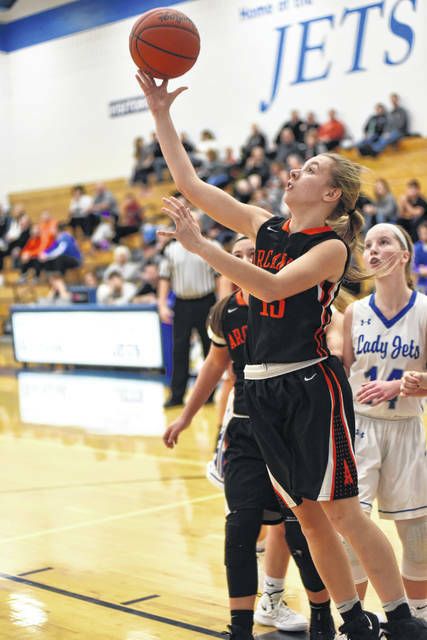 PITSBURG – The Lady Jets were all business in their rivalry game with Arcanum on Thursday night executing to near perfection both offensively and defensively in building up a 32-9 lead at the half en route to a 55-26 final score to win the backyard challenge. Belle Cable was feeling it early connecting on three triples and scoring 14 points and Corina Conley added 9 points in support for the Jets in the first half. 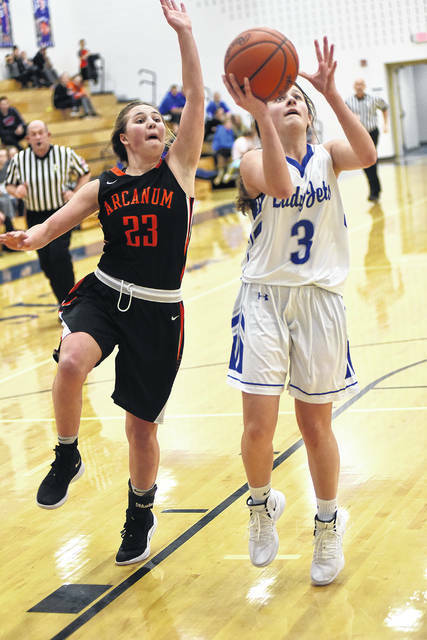 Arcanum trailed 17-8 at the end of the first quarter and was able to get a triple from freshman Madelyn Fearon and two fielders from freshman Taylor Gray. It would get worse as the Jets contested everything. In one stretch Conley had three straight blocks to deny Arcanum anything easy with the Trojans scoring just 1 point in the second quarter. With the score 29-9 Conley stole the ball at half-court, drove to the basket and put up a runner at the horn, the bucket was good and with the harm turned into a three-point play making it 32-9 and all the momentum going into the break. Franklin-Monroe coach Abbey Moore was feeling pretty good about the way her team came out and set the tone in the first half. “I wrote one word up on the board before the game, ‘Composure’ because you never know in these rivalry games how it’s going to go,” Moore stated. Well, it probably couldn’t have gone much better. “That may have been the best half of basketball we have played this year. Just coming out with our defensive effort, our attitude and just putting it all together was something special to see,” Moore beamed. 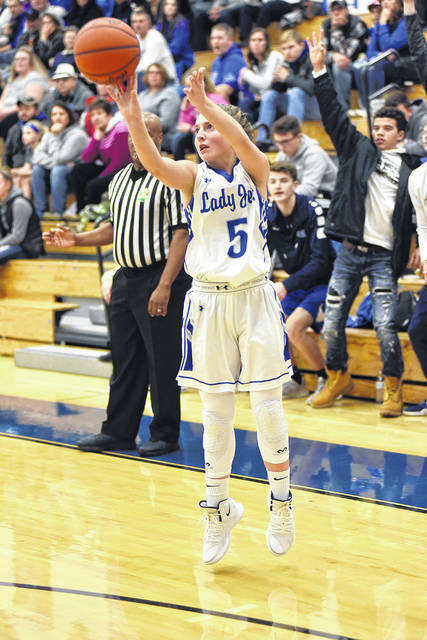 There would be no letdown in the third quarter as Franklin-Monroe continued to execute the offense well with Cable adding 7 more points as the Jets went up 47-15. Arcanum would win the final frame scoring 11 points with Gray getting some touches inside and another freshman Meghan McCans scoring 4 points including a triple. The back-and-forth closely contested game that was expected, just didn’t develop on this night, as Franklin-Monroe went on to win it by the score of 55-26. 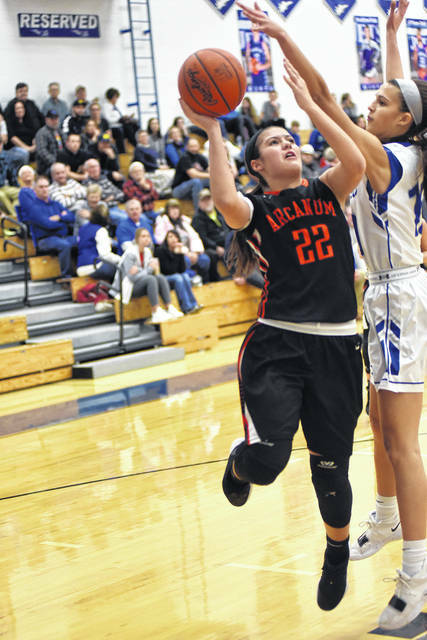 Arcanum was led by Gray with 8 points and falls to 10-6 overall and 5-3 in the Cross County Conference. The next game doesn’t get any easier traveling to Versailles on Saturday if the weather holds out. “I’m so proud on of these girls and the way they came out and took care of business tonight and what a game by Belle Cable. She has worked hard in practice on her shot and was really good from long distance tonight,” Moore said. “Credit her teammates they were setting good screens and getting her the ball when she was open and she was able to knock them down,” Moore praised. Franklin-Monroe was led by Cable with 21 points, Conley had 14 and Chloe Peters 9. The Jets improve to 12-3 overall and 7-2 in league play. Arcanum: Fearon 1-0-1/2 – 4, Unger 1-0-0/0 – 3, O’Daniel 0-1-2/4 – 4, Gray 0-4-0/5 – 8, Siculan 0-1-0/0 – 2, Derringer 0-0-1/2 – 1, McCans 1-0-1/2 – 4. Totals 3-6-5/15 – 26. Franklin-Monroe: Bauman 0-1-0/0 – 2, Cable 4-4-1/1 – 21, Conley 1-3-5/5 – 14, Morris 0-2-2/3 – 6, McGlinch 0-0-3/4 – 3, Peters 0-4-1/2 – 9. Totals 5-14-12/15 – 55. 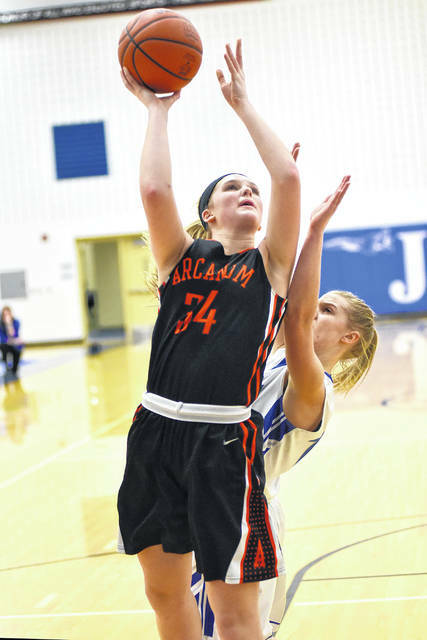 Three Pointers: Arcanum 3 (Fearon 1, Unger 1, McCans 1), Franklin-Monroe 5 (Cable 4, Conley 1). Records: Arcanum (10-6, 5-3 CCC), Franklin-Monroe (12-3, 7-2 CCC).